Our friend, colleague, and co-Editor of this site, Bill Mellberg, passed away on April 18, 2017. A testimonial can be read by [clicking here]. The original biographical sketch that he wrote when this website was inaugurated appears below. Bill (left) and Frank Mellberg (center), Bill’s father, with Harrison H. (Jack) Schmitt (right), together again in Chicago in 2009 after Jack’s launch to the Moon 37 years earlier. Frank was the lead designer at Bell & Howell of the camera optics of the Surveyor landers which helped pave the way for the Apollo landings. Since 1981, Bill Mellberg has addressed hundreds of trade, professional, and corporate audiences throughout North America. He is known not only for his uncanny impressions of political figures, but also for his gentle humor and positive message. His personal philosophy has been compared to Will Rogers’ — mixing satire with patriotism. Mellberg has enjoyed the honor of performing at The White House for President and Mrs. Reagan on several occasions. In November 1991, he was made an Honorary Staff Sergeant by Commissioner Norman Inkster of the Royal Canadian Mounted Police for his many appearances with that world-famous law enforcement organization (the only American to be so honored). The Space Show: Commercial Aviation: A Paradigm for Commerical Space? With Dr. David Livingston, January 31, 2012, 29 Mb mp3 download file (02:07:21): [Click Here]. Topics: 1st hour – opens with a discussion of the early history of rocketry, including the 54th anniversary of Explorer 1, with comments about Wernher von Braun and Ernst Stuhlinger. It proceeds with an explanation of the development of commercial aviation and the mass markets which drove its expansion. An interesting historic discussion takes place with two callers: Richard Easton, whose father, Roger Easton, played a key role in the design of Vanguard and invented the Global Positioning System; and Craig Horton, an engineer with the Space Shuttle program for 30+ years. 2nd hour – Bill compares the problems that the ill-fated Boeing SST and the Concorde, suffered in a highly limited market that had to be heavily subsidized by taxpayers. He points out that real commercial space would develop more readily as an adjunct to servicing a permanent lunar outpost. Bill also talks about the reorganization of NASA into an agency strictly charged with human flight in deep space exploration as proposed by the Apollo 17 scientist-astronaut, Harrison H. Schmitt (see the Preface from Space Policy and the Constitution, or Essay No. 46). The Apollo 17 Launch: An Eyewitness Account by William F. (Bill) Mellberg. A memorable recounting of the father and son adventure of a lifetime, one which many of us would have liked to experience with our own dads. Bill takes us back to his student days to relive a front-row view of the spectacular night launch of America’s last Apollo mission. His story includes an unplanned encounter with the space-suited crew on their way to the Moon. [Click Here] for a 1.5 Mb PDF file of the story. Surveyor I: America’s First Moon Landing by William F. (Bill) Mellberg. Before the Apollo astronauts could explore the Moon, a series of unmanned lunar landers preceded them. Prior to 1966, the nature of the lunar surface remained a mystery. Was it hard or soft? Smooth or jagged? Five Surveyor spacecraft answered these questions and many more. AUS Co-Editor Bill Mellberg’s father, Frank W. Mellberg, was responsible for the design and development of the lenses that gave the Surveyor landers their “eyes” on the Moon. In this article, Bill recounts his father’s role in the Surveyor project and describes the results obtained by the pioneering robotic Moon missions. [Click Here] for a 3.4 Mb PDF file of the story. (left) co-Editor Colin Mackellar and (right) Neil Armstrong above Sydney Harbor at his hotel, while attending a CPA Australia Conference held on August 23, 2011 (A Daily Telegraph summary is given here). Neil showed the audience a film of his Apollo 11 landing as he saw it, taken by a 16 mm camera on board the spacecraft. Colin Mackellar was born in Sydney, Australia, and was in the first year of High School when Apollo 11 made the first manned lunar landing. He had closely followed the build up of the US space program, and the part played by the Australian tracking stations, including Honeysuckle Creek (HSK), Tidbinbilla and Carnarvon. The final Apollo 17 mission was a real highlight, with Australian television audiences treated to most of the EVAs in real time. Colin studied Science at the University of Sydney, majoring in Geology and Geophysics in the 1970s, and then worked briefly as an exploration Geologist. In 1981, following a call to full-time Christian ministry, he entered Moore Theological College in Sydney, and was ordained in the Anglican Church in 1986. He currently serves as the Rector of a church in suburban Sydney. He is married to Janelle and they have three adult children. In 2003, in cooperation with retired space trackers from the Honeysuckle Creek Apollo station, Colin launched the HSK web-site https://www.honeysucklecreek.net/ to help preserve the history of Australian space tracking support. That is a continuing work still in progress. 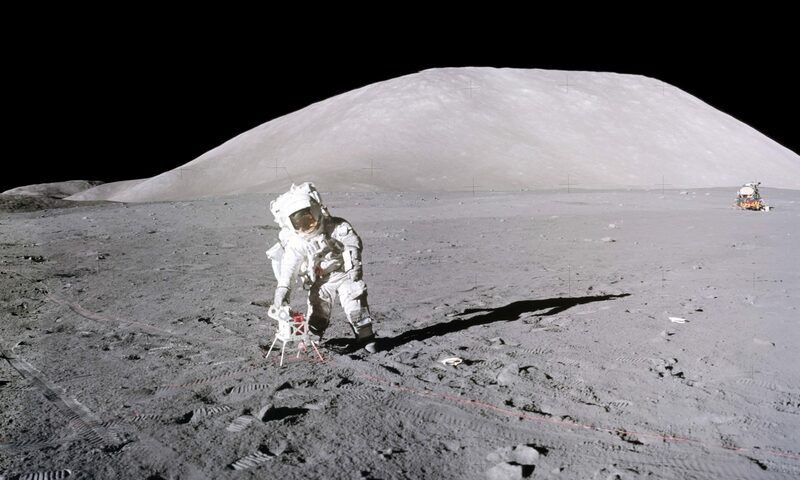 Colin helped initiate the search for the Apollo 11 telemetry tapes made at the HSK antenna, and was one of two Australian members of the search team (a brief summary of the search is given here). The search resulted in a NASA-funded restoration, for future generations, of the best Apollo 11 EVA TV discovered. Colin is also a contributing editor to the Apollo Lunar Surface Journal; and he is a recent inductee as co-Editor of this AUS website. Harrison H. Schmitt (right) and Editor-in-Chief Ron Wells (left) clad in cleanroom “bunny” suits at the Lunar Sample Laboratory, Houston, TX, working with glassy rock sample 70019 seen through the square window port of the stainless steel Nitrogen-filled chamber. Schmitt brought the rock back from the Moon ca. 44 years earlier (01/20/2016). Ronald A. Wells retired in 2005 as a Computer Resource Specialist from the University of California, Berkeley. Ron originally got his degrees in Astronomy at UC Berkeley (A.B.) and at University College London (Ph.D.). He worked for many years at the Space Sciences Laboratory at UC Berkeley as a planetary astronomer in Lunar and Martian studies and is the author of Geophysics of Mars (Elsevier Scientific Publ. Co., Amsterdam, 1979), a research text that integrated earth-based and spacecraft observations of Mars through the early months of the Viking Landers. In another of his alter egos, Ron was awarded two Fulbright scholarships for his interest in astronomy of ancient cultures. He served the first one in Egypt at the University of Cairo and at Helwan Observatory in 1983-4, and the second as a professor at the Institute of Archaeology, Egyptology Division, University of Hamburg in 1987-8. He has published in professional Egyptology journals and wrote the chapter, ‘Astronomy in Egypt’ in the book, Astronomy Before the Telescope (British Museum Press, London, 1996), a collection of 17 chapters treating the development of astronomy in various early cultures around the world. He also authored the articles “Astronomy”, “Astrology”, “Horoscopes”, and “Technology and Engineering” in the 4-volume Encyclopedia of Egyptology (Oxford University Press, New York, 2001). Ron has also presented papers at conferences at the British Museum (In: Under One Sky: Astronomy and Mathematics in the Ancient Near East, Ugarit-Verlag, Münster, 2002) and at the American Research Center in Egypt, Spring Meeting, Tucson, AZ (2004). The Apollo Lunar Surface Journal (ALSJ; https://www.hq.nasa.gov/alsj), of which Ron is a contributing Editor, rekindled his first love of Lunar and Planetary studies because as he says: “I did not get this kind of detail of the missions at the time they occurred since the media failed to keep the public as informed as they should have. Unless one was working in Houston or at the Cape at the Mission Control Centers, it was unfortunately not possible to follow these events as they happened.” Ron first met Jack at one of the early Division of Planetary Sciences meetings of the American Astronomical Society not long after he returned from the Moon. Later, they became associated through work on the ALSJ. In retirement, Ron has formed Tranquillity Enterprises, s.p. in order to continue working in Lunar mapping studies and computer graphics. Between 1969 and 1972, the pioneering Apollo explorers, who blazed the first trails to another world, personified American Exceptionalism at its finest. During this period, they took thousands of photographs in color and in black & white of rocks and boulders, mountains and craters, and breathtaking panoramic views of their surroundings. The Apollo lunar surface images are a scientific and historical treasure, scenes which should be seen by everyone through the eyes of the photographers. Fortunately, with the aid of modern computer software many of these images can be so viewed in 3D. A selection of such photos produced by the author from each of the six Apollo surface missions comprise Volume 1 of the book, Apollo on the Moon in Perspective: 3D Anaglyph Composites by Ronald A. Wells. This book has recently been published by CG Publishing, publisher of Apogee Books, Burlington, Ont. Canada (2018). Use the right scroll bar to move down to the photo ad for the book, or click on 19A in the left sidebar. The book has 152 pages covering all 6 landed missions with printed CMYK anaglyphs. It also contains a DVD with a longer PDF version of the book with more digital RGB photos along with mission folders containing both the RGB anaglyphs and also side-by-side equivalent jpegs for viewing with a Polaroid monitor or with such devices as Crystal Glasses. A set of red-cyan glasses is also included. The publisher has added a rare never-before-published anaglyph video that he personally filmed with a 3D movie camera of the Press Conference of the 30th Anniversary of Apollo 11 in 1999 featuring Neil Armstrong, Buzz Aldrin, Gene Cernan, and Walt Cunningham. Harrison H. Schmitt (left) with his website co-Editors, Bill Mellberg (middle) and Ron Wells (right) at the Chicago Club on the occasion of the Adler Planetarium’s 40th anniversary celebrations of the Apollo 17 Moon mission, November 14, 2012.